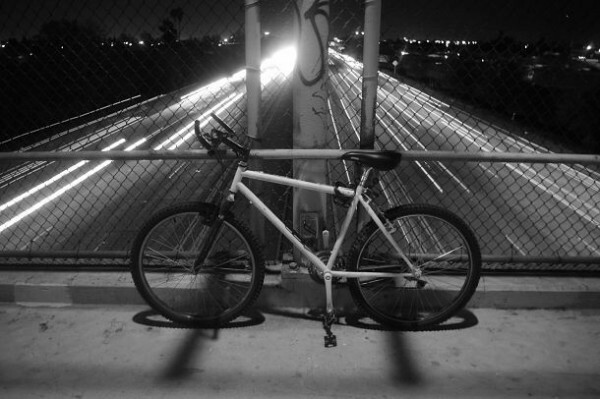 Late Night Bike Rides by Wilfrido Hernandez. Their wheels hum in unheard harmony as they approach the tunnel from opposite ends. The still night air whistles harmonics in their ears, the chorus distracting pleasantly from the crisp cold nipping gently at their exposed skin. They strain their eyes in unison, each fighting the inky darkness of the unlit tunnel and the stark light of their lamps, each just a shadow moving in opposite directions. “We are but two lights passing in the night,” he calls, his voice echoing off the walls of the tunnel. Her brakes squeal as she slides to a stop by the far end, the dim moonlight silhouetting her against the night sky. He stops in turn, looking back at her across the empty tunnel. “What?” she asks, her confusion bridging the silence. “What does that even mean?” She tries to make out his features, but the darkness and distance conspire to stop her. The rear red lights blink steadily, splashing the walls with a gentle and soft hue. “But… you did say something,” she replies, her furrowed brow invisible to the man across the tunnel. Before she can respond, he turns his bike and accelerates away, his tailights fading as he disappears into the night. She ponders his words, wondering the who and the why. She turns her bike homeward, smiling softly as the gentle hum whirs to life once more. Together, they ride.